An EJB container that manage EJB components. A Web container that manage servlets and JavaServer Pages. An application container for standalone GUIs, console, and batch-type programs — the familiar Java applications started with the java command. Applet Container: Applet container includes support for the applet programming model. The applet container is a mixture of web browser and java plug in on client machine . The applet container uses the sandbox security model, preventing applets from accessing system resources and causing harm. Applet container ensures security and portability if it runs in an applet. Applet is initialized by calling the method init(). Applet is started by calling the method start(). Applet is stopped by calling the method stop(). Web Container: A Web application runs within a Web container of a Web server which is also known as servlet container. The Web container provides the runtime environment through components. Web container manages the execution of JSP page and servlet components for J2EE applications. A web container provides the same services as a JSP container .Web components and their container run on the J2EE server. Web server is a server which is capable of handling HTTP request send by a client and respond back with a HTTP response. Enterprise JavaBean (EJB) Container: EJB container is a server-side component architecture. It is mainly used for modular construction of enterprise application. 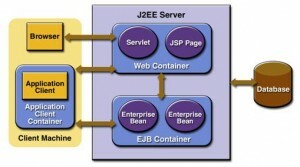 An EJB container provides a run-time environment for enterprise beans within the application server. The container handles all aspects of an enterprise bean’s operation within the application server. EJB container acts as an intermediary between the user-written business logic within the bean and the rest of the application server environment. It manages the execution of enterprise beans for J2EE applications. Enterprise beans and their container run on the J2EE server. The EJB container provides local and remote access to enterprise beans. Enterprise bean can be divided into session beans, entity beans, and message-driven beans depend on the data. Session beans represent transient objects and processes and typically are used by a single client. Entity beans represent persistent data, typically maintained in a database. Message-driven beans asynchronously pass messages to application modules and services.